Nothing wrong with a velvet jacket. Nothing at all. 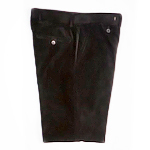 But when you really need to take things up a velvety notch, there’s these downright sultry trousers from Billy Reid, complete with horn buttons and a front watch pocket. And attitude. If you’re going truly formal, might as well go all the way, with a hat that stands tall. 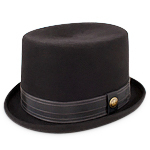 Made of wool, this Goorin top hat has a curled brim and five rows of charcoal stitching. Just be careful. People may assume that hansom cab outside is yours. That’s you, turning double lutzes and triple axels. Okay, maybe not, but that’s definitely you looking good as you make a bunch of left turns on skates. Here’s this loud-but-not-too-loud lambswool sweater. It also conceals your elbow pads very well. ’Tis the season. 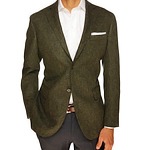 For caroling, for sending cards... and for getting away with green blazers. Especially natty-looking ones like this, from the Richmond-based folks at Ledbury, who are popping up in Georgetown this month. It’ll go great with your mistletoe tie. Just because you’re huddled around a courtyard fire pit sipping spiked apple cider doesn’t mean you can’t continue to make a statement. 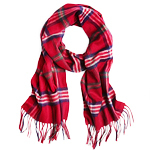 Look here: a statement-making scarf, which happens to be red tartan plaid. And cashmere. At the same time.